Part II of Capital in the Twenty-First Century focuses on the functional distribution of income—how income gets divided up between labor and capital; or to be more precise, this part of the book is about how income is divided between labor income and non-labor income. Piketty groups all non-labor income together and refers to it as “capital income”; he also calls it “income from wealth.” He thinks this division between income from working and income from owning is important because the ownership of wealth is distributed so much more unequally than income, because non-labor income has been rising as a share of total income, and because non-labor or capital income earns a high rate of return. These trends push up income and wealth inequality. Capital Part II documents this. One thing that continually impresses me is the care Piketty takes when presenting data. He seeks to explain the sources of his numbers, their limitations, and then tries to find additional support for his empirical results (through literature or through other sources). Perhaps the biggest lesson in Part II of Capital is that we were deceived about what was possible under capitalism during a large part of the twentieth century. Piketty argues that this time period was unique in history. Capital was destroyed by two world wars and by the high tax rates needed to fight these wars; it was also destroyed because of the inflation many European countries experienced after each of the world wars. Because wealth was destroyed, non-labor income fell as a fraction of income and was a smaller part of the national economy during much of the twentieth century than has been true historically. Because it was smaller relative to income or GDP, capital or wealth did not provide as much income to its owners during a good part of the 20th century as it had provided in the past. This explains why income distribution was more equal in the middle part of the 20th century than it had been during the first decade of the 20th century or during the 19th century. Piketty argues that these temporary changes in income shares gave us a false sense of security about our ability to tame capitalism. What we have seen since the 1970s or 1980s (depending on the specific country) is a catch up from the two world wars and their aftermath. Capital or wealth is reasserting its pre-eminent position; labor cannot to keep up. Empirically we can see this clearly. The share of non-labor income is rising as a fraction of GDP while the share of labor income is falling. As a result, the ratio of wealth to income is also rising in developed capitalist economies—a phenomenon with important economic consequences. While the main argument here is convincing, this part of the book is not nearly as good as the first part of the book. One problem is that Piketty throws too many numbers at his reader without providing sufficient breaks, or support from literary or other sources, or at the least a little bit of humor. Another problem is that despite great efforts to come to terms with very complex data, I have concerns regarding his numbers. Nonetheless, Part II of Capital is an empirical tour de force. Piketty explains his data and its limitations. He focuses on the capital/output ratio (or wealth/output ratio) over time and across countries, and he tries to make sense of the changes in this ratio. There is also some focus on the return to capital income. Piketty emphasizes that the return to capital or wealth has averaged around 5% and that this figure has held constant over long periods of time (stretching back to the 18th century)–except for those times when taxes were increased to extremely high levels in order to fight two world wars. He has found this to hold for many developed countries. It is a major empirical fact of economic life under capitalism, according to Piketty. The key empirical result established in Part II, however, concerns the ratio of wealth (or capital) to income. Piketty shows that the capital/income or capital/GDP ratio (GDP is income) remained relatively steady in Europe for a long time period, at somewhere between 6 and 7, and then fell greatly from World War I through around 1950 to somewhere around 2. It has since returned to its prior level of around 6. This means that the total national wealth exceeds national income by a factor of 6. In contrast to Europe, changes in the US were not so great during the 20th century– mainly because the US was spared a vast destruction of capital during the two world wars. In addition, the US capital/GDP ratio during the 19th century was not quite as high. The US (unlike Europe) had a ready supply of free or cheap land, and so it experienced less inequality in the 19th century than Europe where the land was already owned by a small fraction of the population. The US did experience a drop in its wealth/income ratio as a result of 1929 stock market crash and Great Depression, but this drop was smaller than what was experienced in Europe. In addition, the US did not have a great deal of its wealth destroyed by World War II. Consequently, rather than a sharp drop from a very high point and then a sharp rise again, the US wealth/income ratio over the long term has been less volatile, yet it still fell during a large part of the twentieth century and began increasing sharply at the end of the twentieth century. Piketty makes a big deal about the fact that the capital/income ratio depends on both the savings rate and the growth rate. The savings rate determines the growth of the numerator, while the growth rate determines the change in the denominator. Piketty is clear that savings means all the savings in the economy—both public and private, but that private savings rates are the main driving force. He is also clear that savings means net savings, or savings less depreciation. And private savings include both business savings and household savings. Because savings rates have exceeded the economic growth rates over long historical stretches in the many capitalist countries for which Piketty has accumulated data, the capital/income ratio tends to rise in these countries. This explains the key empirical result in Part II of Capital. The lesson here is that under capitalism there is a tendency for capital or wealth to grow faster than the economy and to come to dominate economic activity. Projecting into the future trends from the past several decades, Piketty estimates that the capital/income ratio will equal or exceed the ratio in Europe in the 19th century, and then is likely to surpass it. With the capital/GDP ratio is so high, wealth or capital becomes the key to success and power, and those who do not own lots of capital become second-class citizens. This is the sort of world Piketty fears. He has generated similar fears in me. However, along with these fears I have some questions concerning the data that supports this conclusion. And several other issues arise from the fact that this part of the book is not argued as well as it ought to be. I take up and discuss these problems below. First, Piketty provides no theoretical explanation for why the return on wealth has been so constant over time. As an economist I want to know why this is so and why competition (or increased wealth) does not drive down the return to wealth. A falling rate of profit due to competition has been part of economic analysis since its inception. Where and why did all those great economists go wrong? Second, the savings rate and the growth rate are not “largely” independent of each other, despite Piketty’s claim (p. 199) to the contrary. Typically, slower growth leads to lower savings rates. When people get laid off from work, the first thing they tend to do is dissave, or use up their prior savings. Certainly, they are not in a position to add to their savings. Second, business firms actually do the vast majority of savings in developed nations. In bad economic times they will sell less and not be able to charge quite as high prices for what they sell. Their profits will fall. But these business profits are the source of business savings, called their “retained earnings”. Finally, government savings will fall during recessions since tax collections drop. This moves the government budget from a position of surplus into one of deficit, or increases an existing deficit. In addition, whenever the government resorts to fiscal policy in order to stimulate a depressed economy, national savings fall because public sector savings decline. Likewise, based on simple Keynesian macroeconomic principles, whenever we have higher savings rates we must have lower spending rates. But less spending also reduces economic growth. So, again, growth rates and savings rates are closely related. They are not, as Piketty contends, independent of each other or largely independent of each other. Here Piketty may have succumbed to the same flaw he thinks others have made. That flaw is looking at one short time period in history and assuming that what is true in that time period is also true for all time periods. The decades immediately following World War II were unique in the sense that there were no major recessions or depressions for an extended period of time. Economic growth rates changed very little, and there was little correlation between economic growth and fluctuations in the savings rate that were impacted by other economic and social forces. The good news for Piketty is that all this doesn’t matter a great deal. Even if economic growth and savings are related, and even if recessions in fact pull down the savings rate by more than the economic growth rate falls, as long as economies do not remain in this condition for long time periods (as, say, occurred during the Great Depression), the long-term trend should be an increase in the wealth/income ratio. This last relationship is something that Piketty himself recognizes. Another reason this does not matter much is that there is a more serious problem with Piketty’s claim about the two main factors affecting the wealth/income ratio. It seems to me that the rise in the wealth/income ratio is not determined mainly by the relationship between the savings rate and the rate of growth; rather, it is determined by the first economic law set forth by Piketty, r>g, which was explained in my previous blog posting. Here is why the first law is the more important one. My wealth grows from year to years for two reasons. To keep things simple suppose that my wealth consists entirely of stock that I own. At the end of this year I will have more wealth than I had at the beginning of this year because my stock portfolio increases in value (by r) and it also increases if I add to my portfolio by purchasing more stock out of my savings from current (this year’s) income—say by automatically reinvesting the dividends that I get from owning shares of stock. These two factors together determine the growth of my wealth. The numbers Piketty himself presents indicate that the return on capital should be the larger of these two forces. A simple example can demonstrate this. Using Piketty’s data, the wealth/income ratio is around 6 and saving rates are around 10% for major developed countries. That means an economy with income or GDP of $1 trillion will have wealth of $6 trillion. With a return to capital of 5%, wealth is augmented by $300 billion every year. Some of this is likely to be consumed, but the fraction of gains consumed will likely be small—certainly half the gains or less. In contrast, the 10% national savings rate adds only $100 billion to wealth (10% of national income). Moreover, some of this $100 billion in recorded savings stems from interest and dividends that automatically get reinvested. This is new saving and counts as new savings. But it also counts as part of my return to wealth during the year, since I can’t receive interest or dividend payments unless I have wealth (money in the bank or stock that I own). So, all told, the return to capital is probably 2 to 3 times more important than savings (barring a great deal of consumption from accumulated wealth). And the return to capital will become more and more important over time if (as Piketty fears) the capital/income ratio rises. To sum up, the big force driving the increase in the wealth/income ratio and accumulating wealth is that that the return to capital or wealth exceeds economic growth. The return on capital increases the stock of capital (the numerator) and economic growth increases income (the denominator). Wealth rises relative to income and the share of non-labor income in GDP rises. There are some additional data problems in Part II, which stem from relying on national income accounts to measure income and its division into labor and non-labor income. Some of these Piketty himself recognizes. One important problem concerns how to classify income as either capital income or labor income. In some cases this is very easy to do. My tax return provides information on my wages, my dividends, interest income I receive during the year, and my capital gains on the sales of stock. The first is my labor income and there are no questions about this. Similarly, it makes sense to call the rest the income reported on my tax returns “capital income”; after all, it arises from my having saved income in the past and accumulated some wealth. But in a number of other cases, this division is not easy to make. To take one example, Piketty classifies royalties as part of non-labor income. As someone who earns small royalties each year, I think of them as part of my labor income. I certainly worked hard writing the books that now pay me a little bit of money. I did not save any money in order to earn these royalties. Nor did I inherit the royalties from anyone. I spent a lot of time at my computer writing. However, in this case I don’t get paid for my labor all at once—it gets spread out over many years. In the case of royalties, the numbers are relatively small (one or two percentage points of total national income and the same for my income) so that this classification decision probably does not matter a great deal in terms of overall trends in the growth of wealth versus income. But the example does show clearly how the actual division of income into two groups can be important. It can also skew one’s results. If royalties were rising as a fraction of compensation, becoming a large part of total income, then some of Piketty’s disturbing results may stem from a decision to regard royalties as capital income rather than labor income. And these results might be reversed if royalties got classified as labor income; in this case we would see rising labor income because of the large increase in royalties. I belabor this point (sorry!) because it exemplifies in simple terms how important the classification of income can be and show how this decision can affect one’s empirical results. In one actual case this issue is extremely important because the size of this type of income is much larger than royalties and because much of this income goes to those toward the top of the income distribution. It was John Stuart Mill who first recognized this problem, and he labeled it the problem of the “wages of entrepreneurship”. The problem is as follows. How to do you count the income of someone who owns a business firm (maybe with one or two other people)? Is this wage income, or is it profit income, or is it some combination of the two? If it is a combination of wage and profit income, how do you divide up the wages of entrepreneurship to analyze the functional distribution of income? To be fair to Piketty here, economics does not provide a satisfactory answer to this question. National income accounting has a separate category that singles out this type of income. It is called “proprietor income” in the US national income accounts and counts for a little bit under 10 percent of total national income. In essence, national income accounts have avoided dealing with the problem of the wages of entrepreneurship by creating a new class of income. In addition, economic analysis waffles on this topic. In the standard competitive model, profits get reduced to zero. But then (usually in some footnote) it is explained that profits are not really zero because there is a difference between economic profits and accounting profits. Accounting profits are positive, but economic profits are zero because these subtract out the opportunity cost of running the business (the best wage that the business owner would have gotten by working for someone else). The problem here concerns how we measure, for each business owner, the wages that they would have received had they worked somewhere else. We need this data to be able to divide the wages of entrepreneurship into a labor component (what they would have made by working elsewhere) and a non-labor component (their profit income from running a business). National income accounting and tax forms just collect and report income data from individually owned businesses. This information is not enough to get at what counts as wages and what counts as profits in this total. It does not answer John Stuart Mill. If income received by entrepreneurs were relatively small, on the order of royalties, this would be a relatively small problem. However, with lots of income going to entrepreneurs, and with the amount changing considerably over time, the problem becomes large. And this is something that might affect Piketty’s results. Piketty solves Mill’s problem by dividing the income made by entrepreneurs into wages and profits based on economy-wide averages, claiming that this is the best one can do. I am a bit skeptical of this claim, mainly because entrepreneurs are not average; average households receive most of their income from wages. Economy-wide in the US the figure is nearly 70%. Beyond this, there is the question of whether the best we can do is good enough? Or does this decision hide some important trends that Piketty’s data is not picking up and that change his story about inequality? Consider the following. More and more labor income may get categorized as corporate income because family-owned businesses are incorporating (say, to take advantage of lower taxes or the greater legal protection provided by incorporating) and are able to reap gains (dividend income or capital gains on the higher value of their business) by not paying themselves much in wages. In this case the data will show a rising a share of capital income but really nothing changes except for the legal status of the business firm. Unlike the royalties case, in this case I am not sure if this problem is big a problem for Piketty’s results. But I sure wish Piketty had addressed it some detail in the book. Indeed, this is something Piketty needs to address in future work. One final word concerning Part II seems necessary. The Cambridge Controversy has been nagging at me while I have read this book. At the bottom of page 201, Piketty makes it clear that he gets his data from national income accounts, which merely add up the incomes from non-labor income (e.g., rents and profits), and also the value of capital or wealth from the best sources available containing this information (e.g., published data land values and stock prices). 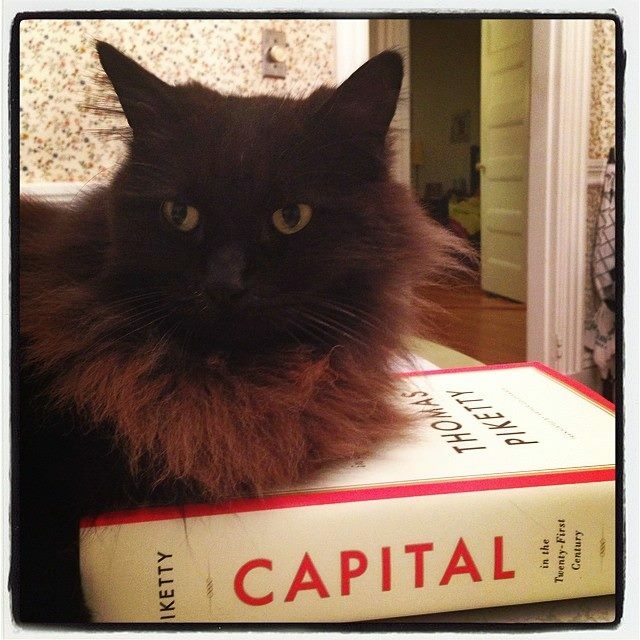 As such, Piketty does not fall prey to the theoretical problems identified in the Cambridge Controversy. There is no vicious circularity in trying to measure capital in order to get its rate of return by relying on rates of return to measure capital. Piketty has measured wealth given the best available data and then compared these figures to measured income using the national income accounts. Having said this, Piketty does not do a very good job of defending himself against the Cambridge critique. When Piketty does address the Cambridge Controversy directly (p. 232), and kudos to him for attempting to do this, he gets things wrong by claiming the problem was really due to the lack of empirical data to resolve the issue. To repeat what I have already said, the Cambridge Controversy was a theoretical debate about the ability to measure something called “capital” in order to determine its rate of return for economic theory and analyze its economic role. All the data in the world could not help resolve this issue, since it is not an empirical issue. This is why Piketty’s work is safe from the Cambridge Controversy. He is doing empirical work and not theoretical work; he is relying on standard measures of income and wealth and examining their relationship over time. There may be flaws with some of these measures (as I noted above), but this only means we must be even more careful with the data than Piketty and even more modest in the sorts of conclusions we draw from the data. It does not mean that the whole attempt is nonsense or that Piketty is caught up in some sort of vicious circle. And Piketty is open to the criticism that he has no theory of what determines the rate of return to capital; but he is not guilty of doing meaningless work because of not understanding the lessons of the Cambridge Controversy.